I am the Lord President of Gallifrey. You can't put me on trial. All aboard, me hearties, for a rip-roaring tale of adventure on the high seas! 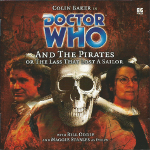 There'll be rum for all and sea shanties galore as we travel back in time to join the valiant crew of the good ship Sea Eagle, braving perils, pirates and a peripatetic old sea-dog known only as the Doctor! Gasp as our Gallifreyan buccaneer crosses swords with the fearsome Red Jasper, scourge of the seven seas and possessor of at least one wooden leg! Thrill as Evil Evelyn the Pirate Queen sets sail in search of buried treasure, with only a foppish ship's captain and an innocent young cabin boy by her side! Marvel at the melodious mayhem which ensues as we sail the ocean blue!